If you have done good studies and you are still not getting a job then you can not wait for any job instead you can earn money by doing many things online but the best and easiest thing is that you have a good knowledge on YouTube. Insert a video and write a video related to your studies so others know it and you get money in exchange for it. . Today, in this post we tell you how to earn money by Youtube ? You can earn money by uploading your video on Youtube. The best thing about this is that you do not need to pay any money for this. You can make your Youtube channel for free. And that video can be loaded. For how to create a YouTube channel, you have given a video below to see it carefully and create your own YouTube channel. To create a YouTube channel from your mobile you must have a YouTube app if you do not have a YouTube app in your mobile, you can download it from the Google Play Store for free, then download the official Android app of YouTube from the Google Play Store first. Do and open and install. When you open the app, at the top you will see an account option, click on the account option. You will see Sania's option as soon as you click on which you have to sign in. Once you click on Sign In, you will see a plus icon in front of the account. If you have logged in to an email ID in your phone, then you will also see it here if you want to create your YouTube channel with that email ID. Then select that email ID and login directly and if you want to create a new account, then click on the plus icon to create your new account. After creating a new account or login with your old account, you will come back to its home screen. And again click on the icon of the account . Then you will see your name here but you have to fill the name of your YouTube channel like the name of our Youtube channel is techno ganpat. So you will also fill in some such name of your YouTube channel here and click on the Create Channel below. Now you have to do your channel settings. To set the settings, click in the settings icon. Where you have to put your channel logo and back cover for the channel. It is very important to apply both of these things if you do not have logo or cover on your YouTube channel, then your YouTube channel will not be professional, then firstly, you can add people or photos to your channel. After that you can change the name of your YouTube channel again. And below it you have to give a description of your YouTube channel. In the description, you will tell about your YouTube channel, which topic about which topic your YouTube channel is about, if you put videos related to it, then it is very important to fill out all this information. 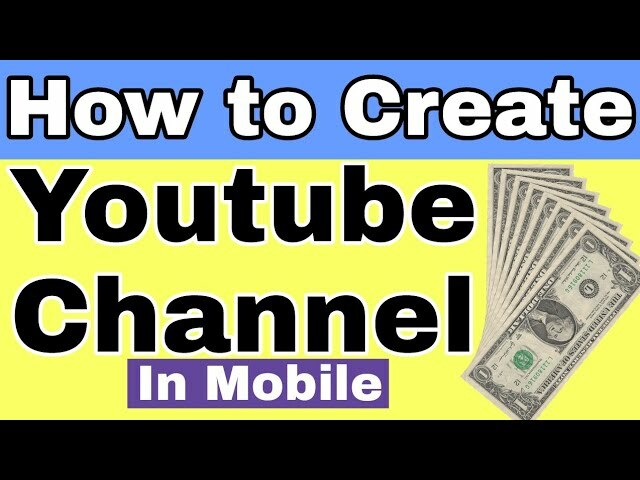 After you create a YouTube channel, you will have to type it in the mouth to earn money, you can use the computer for it if you do not have a computer, then you have https://www.youtube.com in your mobile Google Chrome browser. Com / Account_monetization can open this link. Before you open this link, you have to click on the Google Chrome menu icon and then click on the top of the Desktop Site as shown in the photo below. Clicking on the above link as you click on the Desktop Site and below you have to follow all the steps mentioned in the video. You have been given the icon of the video above to upload videos to YouTube from your Android app. You have to click on the icon of the video. Once you click on the icon, another icon will appear in front of you and if you want to go to YouTube, then click on the video icon above. Below you will see all the videos from your phone that you want to upload the video. Description: Tell us about your video that what is said in this video is a special thing. Privacy: If you public this video, then it will be visible to everyone. If you do private, only you will see it. If you unlisted, then you will be able to see the video with which you will link to this video. After filling in the full information, click on Upload Icon . Your video will be uploaded once Icon is clicked and you can upload a video from your mobile. If you want to upload the video from your computer, then further details have been made about it. First, go to Youtube.Com in your browser and click on Sign In option on the right side. On the eve you need to log in with your Gmail Id. After logging in, click the Upload button at the top .On the next page You can upload videos and you can also come up with Video Create, you can create a video by adding your photo. Select Files to Upload, you can select the video from your computer. Once the video upload is selected, the video upload will begin. But this is different from this and also the ottoman is given here. Like Facebook, Google also has a social platform called Google+ if you upload a video or a video, you can also import and upload it as well. You can create new videos online with the help of Photo Slideshow and Video Editor. If you have a video with any option, you will have to fill in the details later, if you select the video by clicking on Select Files To Upload, your video will start uploading afterward. You have to fill the details about the video. As soon as the video starts uploading, you will be filled with details about the video as we have highlighted in the photo. In the description, what you have been told in the video, write a few details about "How to make money from Youtube". In Custom Thumbnail you can apply a cover photo for your video. Which means that you want to watch the video from the thumbnail of your video, but do not put a wrong photo and do not add photos that are not related to the video. You can click on A to ON and you can write the title . You can keep your video in 3 ways on Youtube. Public: The video will appear to everyone on Youtube. Unlisted: The video will be visible to the person who has the link to the video. Your video will automatically be shared on your Google+ account, if you want to upload to Twiter, then you can select Twitter option from here. You can create a playlist of your videos like "Online Money Earn" video separately in different lists '' How to create a website '' video list differently. To set more than this, you can set the settings by clicking Additional Setting. In Additional Settings you can disable the comment on your video. You can hide the video rating .Whatever you can do to get ads on your videos in the tab of the Monetization tab, you can get this information in the next post. When your video is complete upload, click the Publish button above . Facebook How to Make Money on YouTube How to Make Money on YouTube How to Make Money on YouTube How to Make an Account on YouTube How much money you get from YouTube. If you have any questions or suggestions besides this, please definitely ask below. And do share this post so that others can also know about this information.